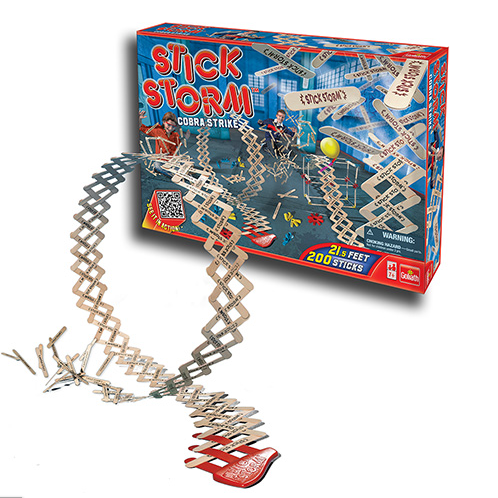 Win a set of the Stick Storm Cobra Strike to make your own popsicle stick chain reaction! A $24.99 value. Best for children 7 years and older. This set comes with 200 sticks, 1 starter tool, 12 connectors, 8 balloons, 4 balloon trigger sticks, 4 balloon trigger clips, 1 balloon mouthpiece and novelty glasses. Sign up below to get your own popsicle stick bomb set! About Stick Storm: This is not your everyday, run-of-the-mill popsicle fort. Tim Fort, the self-proclaimed “Kinetic King,” weaves amazing chain-reactions masterpieces using sticks, connectors, bridges, and balloons. When these elaborate creations explode, kinetic energy causes them to rise up 3 feet off the ground like a huge cobra ready to strike. Now, children can create their own explosive designs with Stick Storm, the building sets by Goliath Games based on Fort’s concept.